How to add watermark to PDF file so as to reduce piracy of the documentation with A-PDF Watermark? My PDF has many precious images which I do not want others to copy. Can I add watermark to all PDF pages so that copyright of my PDF? Is there a A-PDF tool that helps to add watermark to PDF file so as to reduce piracy of the documentation? I suggest you to use A-PDF Watermark. A-PDF Watermark allows you to add text/image/PDF/shape/dynamic datetime watermark to all or each PDF pages. If you want to copyright all PDF images, you can add text (your company name or website URL) as the watermark to all PDF pages. If you do not want the watermark occupy more space, you can add logo as the image watermark to your PDF pages. 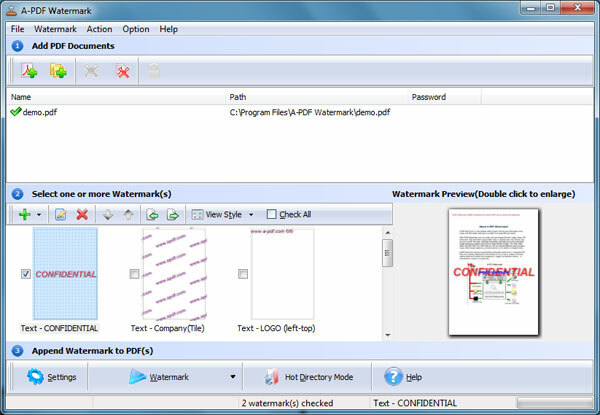 The below article will show you how to add text watermark to all PDF pages. 1. Download and install A-PDF Watermark to your computer, compatible with Windows 2000/XP/Vista/7. 5. 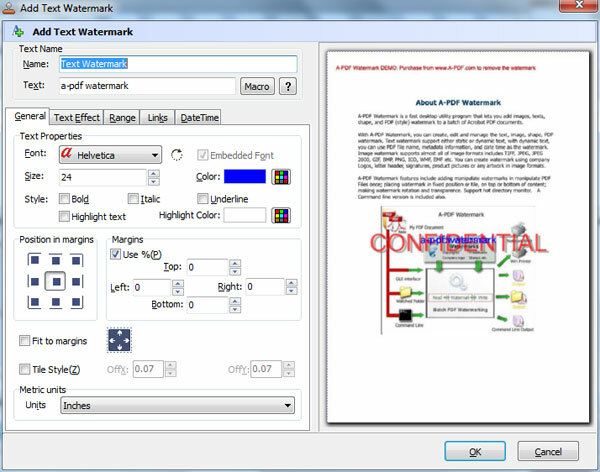 The watermark you designed can be previewed on the software interface, click to add watermark to your PDF files.